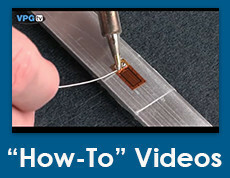 Training customers in the proper use of strain measurement techniques is an essential part of the Micro-Measurements philosophy. In support of this principle, Micro-Measurements conducts an extensive series of regularly scheduled technical seminars, workshops and short courses. These training programs are intended for managers, design and test engineers, technicians, teachers, and anyone else involved in stress analysis testing or in transducer development and manufacture. Although most of the training sessions are conducted at Micro-Measurements facilities in the United States and Europe, many are also held at hotels and educational institutions around the world. Special in-house programs at the customer's place of business can also be arranged. Course instructors are recognized authorities in their field. Select from the drop down in the form below the Technical Training Program you wish to take. Fill in your contact information in the Online. Registration Form below. Click on the submit button. Fill out the form and follow the instructions on the form for submission. In this comprehensive, hands-on Workshop, participants make several complete strain gage (strain gauge) installations, including electrical connections, check-out, and environmental protection; and use appropriate readout instrumentation to verify results of their own installations. This program is presented in a format which includes several hands-on laboratory exercises. Liberal use of demonstrations and case studies provides attendees with a first-hand opportunity to learn how to select the procedures and techniques best suited to their strain measurement needs. This program is presented in a format which includes several hands-on laboratory exercises. In this hands-on workshop, each participant completes three gage installations using materials selected for suitability in a majority of test environments. This seminar is suited to technicians, engineers, or managers who are responsible for designing, manufacturing, or testing strain-gage-based transducers. It is an intensive, two-day review of the materials, components, production methods and test methods used to build these devices. This seminar is suited to technicians, engineers, or managers who are responsible for designing, manufacturing, or testing strain-gage-based transducers. It is an intensive, one-day review of the materials, components, production methods and test methods used to build these devices.